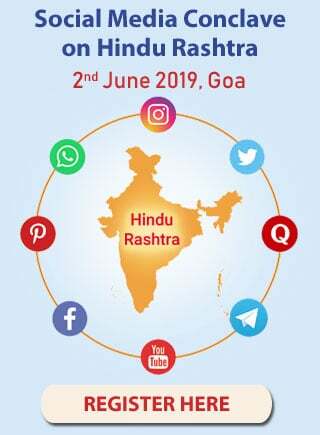 Food served on the day of shradh should be ideal. Ideally such meals should be cooked everyday throughout the year; but, since this is not possible, it should be done at least on the day of the shradh. 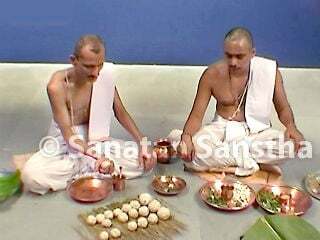 Cooking of different items served during shradh should be done on gruhyagni (In the marriage ceremony after the ritual of panigrahan, this marriage hom is performed. That fire is brought home, installed and ahuti [Offering] is made unto it in the morning and evening. Such a fire, enriched with sanskars (impressions), is termed as gruhyagni) or on the laukikagni (Fire devoid of sanskar). 2 A. Around the leaf meant for the pitars, a border of (pishangi) bhasma should be drawn in an anti-clockwise direction. 2 B. Shradh food should be served on a plate woven from mahua (Madhuca Indica) leaves or on a banana leaf. 2 C. Salt should not be served on the leaf for Brahmans invited to the shradh. 2 D. Sweet delicacies (laddoos etc.) should be served with the hands only; but, vegetables salads, chutney etc. should never be served with the hands, instead a ladle or spoon should be used. Begin by smearing the leaf with ghee. Then, serve rice in the centre. To the right, serve kheer, colocasia leaf vegetable and vegetable prepared from fruits. Lime, chutney and wet salad should be served on the left of the leaf. Curry, coconut curry, papad, kurdai, vegetables and black gram vada, laddoo should be placed on the upper side. Finally, dal (Pulses) and ghee should be served on the rice. Place the leaf on which food is served for the Deities before them, sit on the opposite side touching the right knee to the ground. 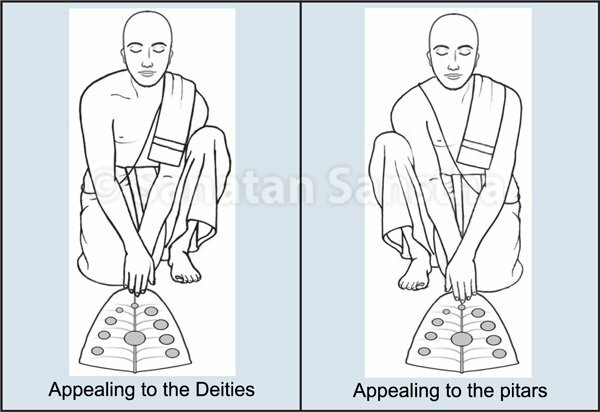 Hold the leaf with the right hand on top of the leaf and left hand under the leaf, and appeal to the Deities to partake of it. 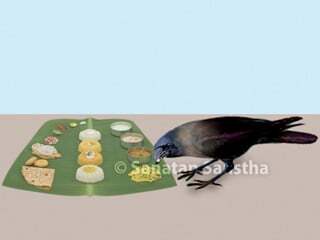 Place the leaf on which food is served for the pitars before them, sit on the opposite side touching the left knee to the ground. 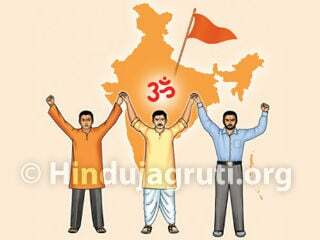 Hold the leaf with the left hand on top of the leaf and the right hand under the leaf, and appeal to the pitars to partake of it. While appealing to the Deities, Sattva-predominant vibrations are activated at the venue; whereas, while appealing to the pitars, Raja-Tama-predominant vibrations are activated. The individual gets more Shakti by appealing to the pitars to partake of the food in the rite. If the ritual of appealing to the pitars is performed with bhav, it bestows greater benefit to the performer and waves of bhav are created in him. Vayu, Varaha and Vishnu Puranas state that, ‘Yogis (Ascetics), evolved souls and Deities assume different forms and wander on the earth. They assume the form of a Brahman and supervise the shradh rites. As per the Markanḍeyapurana, ‘If an Ascetic or renunciant is served a meal during the shradh, the pitars are appeased tremendously’. Hence, if a guest appears suddenly during the shradh rites, he should certainly be served a meal. 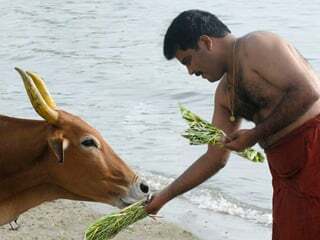 A Brahman partaking of a meal during the shradh has to undertake atonement such as Pranayam (breathing exercises), drinking water charged with the Gayatrimantra, Chandrayan (Expiatory observance regulated by the moon’s waxing and waning in respect of the daily meal), fasting, etc. depending on the form of shradh performed.